Cutout ankle boots - They're everywhere! Many brands are designing this amazing boots right now, so you can find it almost everywhere. Cutout ankle boots - Estão por todo o lado! Imensas marcar estão a lançar estas ankle boots agora, por isso podes encontra-las em quase todo o lado. Platform shoes - They're are available for all tastes and in all formats - sneakers, ankle boots, moccasins, ... I particularly like more the boots and the sneakers. And about where you can find them... Well, just like the cutout, everywhere, branded or not. 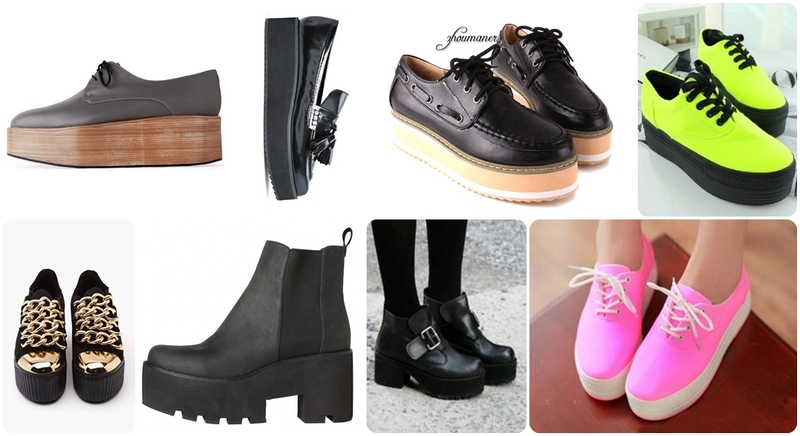 Platform Shoes - Existem de todas formas - sapatilhas, ankle boots, moccasins e disponiveis para todo o tipo de gostos! E acerca de onde os podes encontrar... São exactamente como os cutout, em todo o lado.